Description: The purpose of this Lab is to configure ISDN BRI 0 interfaces on Routers NY01 and LA01. The interface ip addresses, subnet mask, and switch-type are given in the network diagram. 1. Enter global configuration mode and assign hostname NY01. 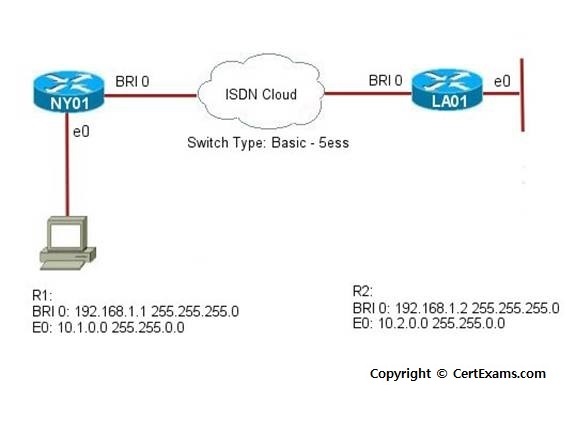 Specify isdn switch-type Basic-5ess. 2. Enter bri 0 interface configuration mode, and assign IP address as specified. 3. Enable ppp encapsulation, and exit bri 0 interface configuration mode. 4. Configure dialer string to call phone number 5554444. Specify dialer idle timeout as 10 minutes. 5. Enter E0 interface configuration mode and assign IP address as specified. 6. Exit interface configuration mode, and specify protocol ip to be the only interesting traffic on isdn access line. 7. Apply the dialer list to interface isdn bri 0. The procedure to configure LA01 is similar to that of NY01, except for the hostname, and IP address assignment. 1. Enter global configuration mode and assign hostname LA01. Specify isdn switch-type Basic-5ess. 4. Configure dialer string to call phone number 2224444. Specify dialer idle timeout as 10 minutes.